This is an article by me and Corey Bradshaw, published today in The Conversation. I’m republishing it here. Is the future of biodiversity conservation nuclear? an energy mix with a large nuclear contribution (50% of energy mix) plus a balance of renewable and fossil-fuel sources with carbon-capture-and-storage. We then ranked seven major energy types: coal, gas, nuclear, biomass, hydro, wind, and solar based on economic and safety costs, and environmental benefits. We also tested the sensitivity of these rankings to bias stemming from philosophical ideals. For instance, if you were most concerned about pursuing low carbon emissions, you might weight that criterion twice as heavily in the analysis as the lowest-cost option. When compared objectively with alternatives, nuclear power performs as well or better that other options in terms of safety, cost, scaleability, reliability, land transformation and emissions. And overall, the mix including a substantial role for nuclear performed better than the other scenarios. Although our analysis was based on existing nuclear designs, we were most excited about the advantages offered by next-generation nuclear power now under construction in Russia and China. If deployed widely, this technology could provide emissions-free electricity, by recycling a highly-concentrated energy source in a way that consumes waste and minimises impacts to biodiversity compared to other energy sources. 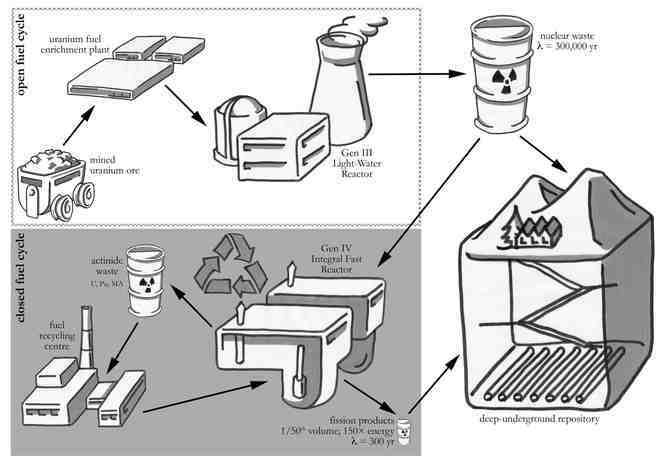 A sustainable nuclear fuel cycle that ‘eats’ nuclear waste to produce abundant zero-carbon electricity and no long-lived byproducts. Ultimately, there is no perfect energy source. Conservation professionals and environmental advocates need to take an evidence-based approach to consider carefully the combined effects of energy mixes on biodiversity conservation. 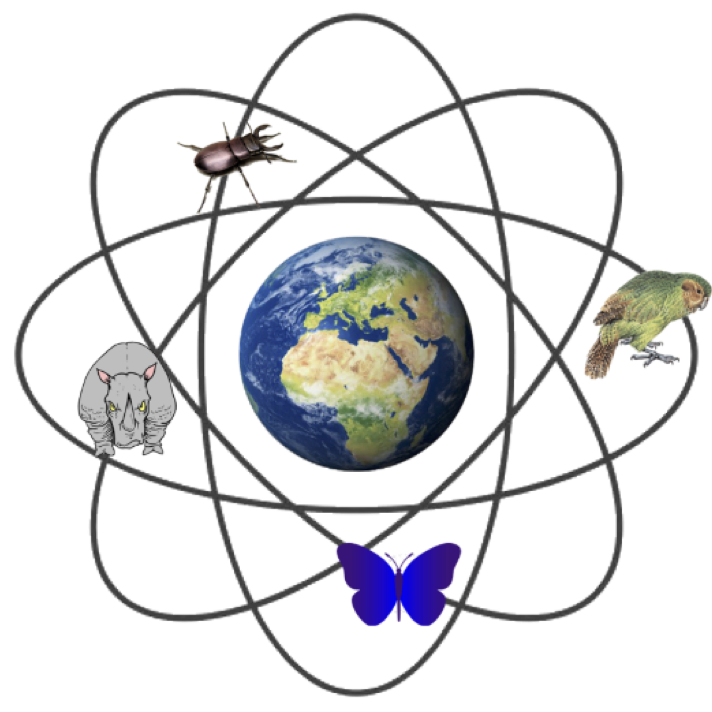 Much as leading climate scientists recently advocated the development of safe, next-generation nuclear energy systems to combat global climate change, we argue that only by leaving our energy options open can we maximise our chance of conserving biodiversity and natural habitats during this century and beyond. For example, the use of nuclear energy for electricity generation is prohibited federally within Australia under the Environmental Protection and Biodiversity Conservation Act 1999 (see section 140A). This needs to change if we are serious about maximising our changes of displacing fossil fuels. There is strong evidence for supporting advanced nuclear power systems with complete fuel recycling as part of a portfolio of sustainable energy technologies, that also includes appropriate use of renewables, energy storage and energy efficiency. We must accept that trade-offs and compromises are inevitable and require advocating energy mixes that minimise net environmental damage. A key message is that the ideal mix of nuclear and renewables will be regionally dependent – being modified by, for example, available land area and renewable potential – and should be compared objectively without prejudice or preconceived notions. The environmentalist mantra on energy needs shift from “100% renewables” to “0% fossil fuels”. That should be the primary goal. It is time that conservationists make their voices heard in this policy arena. Well said Barry.It’s a good challenge for the anti-nuke environmentalists and especially the Greens. I’m personally still working as though Australia has already gone or will go nuclear and my current speech which will be delivered twice early new year outlines what the development of the full nuclear fuel cycle in South Australia over coming decades, will do for our state. Nothing will happen if we can’t get the politicians on side and that’s who I’m still targeting as I have been for the past 6 years.I’m making progress. Will keep you posted. A good angle Barry. The Greens believe they are the guardians of the environment. I’m sure they will try to discredit your paper for the sake of their ideology. We wait with bated breath. Barry I am so pleased to read your article. If any one thing differentiates humans from every other species on this planet It is our mastery of Energy. The rapid growth in our standards of living in the last 200 to 300 years have come about as a direct result of unlocking the power of steam and then the power of electricity. But the full potential of Nuclear Power has not yet been reached. It has stalled at a very early stage of development as a result of politics, misinformation etc. I hope that this century will be the one in which the full potential of Nuclear Power from sources such as Thorium and the use of Molten Salt Technologies and even other technologies not yet discovered can be unlocked. Imagine, even now the environmental benefits of replacing the brown coal burning power stations at Loy Yang in Victoria with some Westinghouse AP1000 uranium reactors. Why generalise to the whole world? Regional differences make a huge difference to the energy options. And so your claim that ‘energy demand continues to rise’ makes me stop reading. Electricity demand has fallen 5 years in a row in Australia. If that makes you stop reading, you have a short attention span or a limited view. The list of signatories is international, the issue is global. Barry, you’re in for a very long wait (but I think you already know it) if you expect activist environmental NGOs to stop lambasting nuclear power. The french example shows what to expect: not much. After 25 years of 90% zero carbon electricity thanks to a large nuclear fleet, the Greens are still dead set against nuclear power. Note that I am not speaking of being in favour, but just to agree to preserve what has been built. * Nuclear power is a drop-in replacement for coal in electricity production, without the immediate pollution concerns and dangers of coal. * The amount of waste is limited, because the amount of fuel is tiny. The basic reason is that their opposition has nothing to do with science. It’s more like a belief. Sadly, that means reasonable arguments can not do much about this situation. Like other belief driven groups (like climate “skeptics”, inter alia), they will refuse to look into reasonable arguments, and they will invent reasons to do so by saying it is biased work, paid for work, work of a “useful idiot”, that there is too much uncertainty, etc. I agree Proteos. But a journey of a thousand leagues..
By using some storage, either thermal, pumped hydro or batteries, the actual generation for a grid can be 100% nuclear. Yes, we need more nuclear power. There is absolutely no way that we could power the world with the solar energy alone. After all, the Earth only receives 23,000 TW yrs per year of energy from the sun. How could our current needs of 16 TW yrs per year be met? There’s also no energy storage technologies in existence for solar power. We would have to develop something called….a battery. Not gonna happen. So, yes, nuclear is our only viable option. David B. Benson: then why isn’t there a single 100% nuclear grid anywhere on the world? Why did France stop at 75%? France stopped at about 80% because they had hydro for most of the rest and peaking plants for the remainder. It simply wasn’t worth spending the capital to go to 100%. France never hit 80%. When you subtract dumping electricity on their neighbours it was more like 70-75%. It simply wasn’t worth spending the capital to go to 100%. In other words: it’s too expensive. Your comment can be seen as nothing other than trivializing the climate/energy problem. It is unprecedented in scope and difficulty and definitely will not be dealt with by one-liners. After many decades of batteries, there is less than 0.5 GW deployed worldwide and it took about 10 years to get that far. Perhaps that is telling you something. World energy production will quadruple to 2050. There are billions of people who want clean drinking water, washing machines and lighting, and they’re going to get it. Half of the area occupied by solar cells does not contribute (to avoid self-shadowing and allow maintenance). The panels are 10 – 20 % efficient (cheap mature tech). In other words, you need to level the ground of an area 2.5 to 5% the area of the Earth (e.g. an area between the size of north america and north + south america in land area). You need to clear and level this ground, spray roundup to make sure nothing grows there and keep spraying to make sure it stays dead forever. That’s an area comparable to world agriculture. Great! You’ll need seasonal battery storage unless you intend to overprovision your photovoltaics by about a factor 2(doubling the land area, permenantly lost from nature) to deal with low winter production. The cheapest battery storage, which is still lead acid batteries invented 150 years ago, costs $150/kWh. If you want to store 16 TW years, which is about 1/4 of world energy demand per year in 2050, you will need 20 quadrillion dollars worth of batteries. With overprovisioning you’ll only need a week or so of storage, for a more moderate 1,4 quadrillion dollars. The cycling on the smaller amount of storage is much faster so it will need to be replaced every decade or so. As nuclear becomes cheaper than carbon fuelled generators, either by mass-producing the former or carbon taxing the latter, it becomes economically feasible to allow a nuclear generator to idle back as consumption drops. 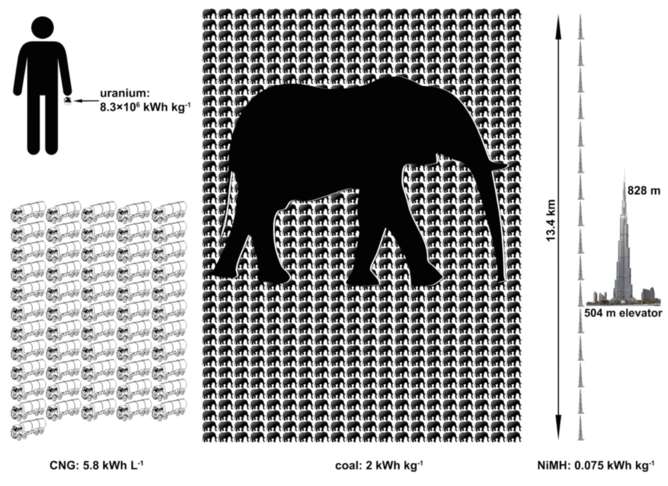 Then as demand increases, power can be drawn from reserve capacity as if the NPP was itself a gigantic battery of immense capacity. Until then, it is accountants who will answer the question of which consumers or generators should lie idle to match demand with consumption. To my liking, it is the heat stores of multi-stage flash distillation (desalination) that can fluctuate according to the amount of excess power available. I am impressed by the stamina of those who continue to trot out supposed problems with nuclear power that were solved 40 or more years ago. Load following nuclear, thus reducing greatly the need for peaking plant? Done before 1980. Demonstrated in practice, in France and many other places worldwide, to be manageable for loads between 30% and 100% of nameplate rating using a fresh charge of fuel rods, declining with age to perhaps 70 – 100%. Thus, batteries are not needed now or ever for nuclear power plant. As someone else said, surplus electricity can be diverted to certain processes such as desalination. Those who claim that 100% solar power would be either adequate or socially acceptable in an industrialised nation are misguided. While I am not personally convinced that 2 x North Americas’ worth of land would be required, my experience with solar thermal convinced me absolutely that there is not sufficient land for a global scheme, let alone the costs and security issues posed by the transmission systems required. Speaking of security, little has been written about the comparative security threats to and from (a) Current commercially available nuclear, (b) Gen IV nuclear, (c) Global or sub-global transmission-linked solar+wind, and (d) SMR nuclear. Hugely multiplied transmission towers and cables pose substantial security risks, because of the sheer number and nature of the pylons. Bougainville Copper was forced to abandon the then world’s second-largest copper mine because it could not defend, even with military support, the transmission lines between the port and the mine site. Indigenous activists using small arms and small explosives did the job. The mine remains closed. I doubt very much whether a global spider’s web of HVDC and HVAC grids could be defended against even a third-rate militia. Besides which, the risks would be uninsurable at any price. Security is thus a game-killer for global, massively interconnected solar+wind. Regardless of cost, performance, resource and other issues, it simply cannot be reliable unless there is permanent, global peace. When will that be? There are a lot of tools we can utilise to help ensure the resilience of future generations in a climatically destabilised future. Irksome sarcasm is not one of them. Humm, some people put solar panels on the roof, how about doing that more generally so as not to require vast amounts of land? Residential solar PV is at or near grid parity in some regions, so transmission lines may not be needed. I see this statement coming out of a sense of desperation due to the signers inability to accept the real cause of the present situation. That is humans with their innate sense of superiority, their confidence that we can fix any problem we create and their general hubris driven by their egos which blinds them to the reality. It smacks of the cognitive dissonance that I believe most of the 7.24 billion human inhabitants of planet Earth seem to be immersed in. All their dreams and aspirations are under threat so this kind of denial should be expected. It comes from people who can’t accept that the planet is grossly over-populated with our species and that it’s cruel to bring another of us into this world. It comes from those who can’t see that the mess we are in is a product a couple of hundred years of engineering that was suppose to constantly improve our lives. It comes from those who can’t accept that the economic system, which billions of us have come to depend upon, is corrupt and that it just keeps digging our hole deeper and deeper. Nuclear power production is the product of engineers and physicist who have felt supremely confident that they have considered every possible fault possibility. They put the power production ahead of dealing with the waste in many cases. The potential hazard-life of the discharged waste fuel requires human intervention for at least 100 years. It assumes we will be around that long though the overwhelming evidence, from the vast majority of climate scientists and from evolutionary biologists, is suggesting that we may go extinct within a few decades. Once industrial civilization collapses it is likely that there will be hundreds of nuclear power plant meltdowns and spent fuel storage pool radioactive fires. It would make more sense to start shutting the reactors down now and to prepare for the time when the fuel can be shifted into storage casks. These are the kinds of things most environmentalists realized decades ago and to switch such a position only demonstrates the state of desperation that is overtaking us. It’s looking like we will keep struggling to keep your heads afloat and when we go we are likely to take millions of other higher species along with us due to crashing this planet’s life support systems. Turboblocke, that is just graffiti. The article urges us to think through our perceptions, rather than just repeat them. In this instance, check what would happen if you really did cut the transmission lines to an area of PV “grid parity”. We then realise that that concept is one of these idealistic perceptions that is leading us all to disaster. Using batteries for nuclear power is wasteful. The main cost of nuclear are capital costs so it’s better to just have it running full blast all the time. When it’s not being used to meet other demands it should be used to electrolytically make the chemicals that will be in short supply when we stop using fossil fuel. As for what processes are to be used, what’s needed is a balancing act between efficiency and capital costs. The more sporadic the electricity the less important efficiency is and the more important low capital costs are. Great article. I hope that eventually people come around to supporting nuclear power. I want to live in a world that has hope. Gasbuggy I find the ethics of your statement questionable. You say there are to many people which is basically saying some of these people shouldn’t have been allowed to exist. That is kind of a horrifying view of things. I believe that human life is valuable. Because human life is valuable technology and engineering are valuable because they have allowed more people to live then have ever lived before. When people where hunter gathers the population was very limited. Luckily people developed agriculture and more people got to live. Then we started harvesting energy outside our bodies and even more got to live. If we harvest the power the the atom we can maintain a population like this for a good while meaning then even more will get to live. This is a wonderful thing! You know this earth wont last forever Gasbuggy. Life has existed for around 3.5 billion year, and some people project that it can last another 1.75 billion. It’s more then half way over, and for most of that time human being haven’t existed. Why not allow the human race it’s time under the sun. Gas buggy, from what you say it is clear that a 2040s population cannot be supported on 1940s technology. Unlike other contributors, you seem to be proposing a 1940s solution. Indeed, in their paper ‘Key role for nuclear energy in global biodiversity conservation ’in Conservation Biology, Prof. Barry Brook and Prof. Corey Bradshaw put nuclear costs at $108.4/TWh, on-land wind at $86.6/TWh -although I think that should probably have been /MWh! David Elliott, if that is the case, why is nuclear illegal in Australia? Not uneconomic. Illegal. Why do green NGOs actively oppose nuclear energy? If economics are the only concern of environmentalists, then nuclear should be ‘in the mix’, and it can be ruled out by the market if it is uncompetitive. 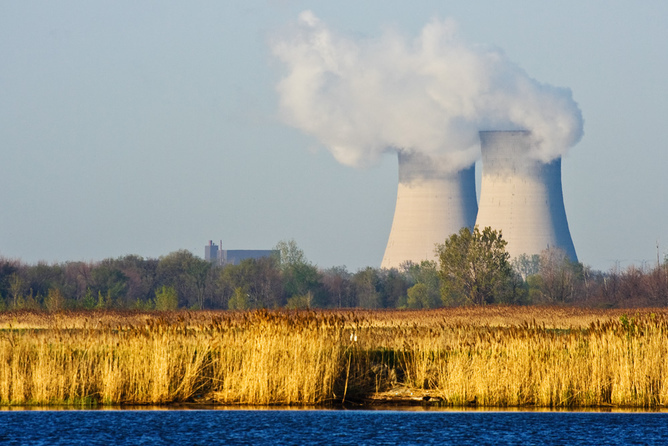 Environmentalists should not oppose nuclear energy. They should just ask that it be assessed against the same criteria as other energy sources. I don’t know much about Australia but in most other countries nuclear is eligible to be in the mix. And in many it has failed the market test. In the UK (and US) it’s being buttressed by a range of subsidies- including a £10bn loan guarantee for Hinkley and £92.5/MWh for 35 years CfD support. Green NGOs can do very little about that except complain that renewables are not being treated the same. And also point to the many problems of nuclear. Which combined, I suggest, make it a non solution to climate change, indeed a diversion from solving the problems. The UK is likely to have around 30GW of wind capacity in place on and offshore by 2020 and by then PV solar could be cheaper than both and might add a further 10GW (PV is now at 5GW) . They could all be cheaper /kWh than the 3.2GW Hinkley plant by around 2024 when it may start up. Yes they will need balancing capacity, but that already exist e.g. in the form of gas fired plants, though they will be used less overall, given the wind and PV inputs, resulting in a potentially large net carbon and cash saving. you say that the price of RE power has been decreasing and will continue to do so. Actually, in the past decade, only solar PV has seen a real price drop, but starting from stratospheric levels. As a result, it has become roughly competitive in desertic areas close to the tropics only in the last couple of years. It still has a long way to go elsewhere. The price of wind power has been roughly stable, at least in Germany and in France. In France, the same feed-in tariff as in 2007 is still in force (about €82/MWh). The German energy lobby BDEW has a nice document showing the average prices paid for all renewables sources (see p65): most have seen no price decrease, sadly. As for the future, of course, I can only place my own bet: that it’s far from certain that the future will see price drops for renewable energy. To back this, of course there is past history, where most sources have failed to produce such a drop in the last decade. There are also long term contracts that show that sources like offshore wind are far from competitiveness in most places. In France, offshore wind parks will get about €220/MWh (depending on the index linking). In the meantime, Flamanville 3 has been rated as a business disaster for years, yet its LCOE is still about €100/MWh (give or take 10%). We could go on and on about the economical and technical merits of all energy sources. The case for the undisputed economic superiority of renewables sources of electricity over all other forms is far from settled, in my view. The only point where you are 100% right is that the economics do not favour nuclear (but neither renewables!). Here in Europe, with the current price of carbon, a baseload hard coal power plant has probably a LCOE of €60/MWh. No other source can match that. Match this price with baseload renewables or nuclear and you can think of flooding the market. Not before. If the nuclear industry seriously wanted to increase its throughput it would design a 120 megawatt nuclear module for powering large ships. This is a customer that has to be tailor made for nuclear power. Ships run at constant power for days en route then power down gradually on approach. In port if the reactors were able to ramp up in an hour then the ships power could be sold to the grid while the ship was in port and with stays of .7 to 1.2 days this power could well offset port fees to a large extent. Ten ships in port and you have up to 1.2 gigawatt available. After analysis it might just be the case that the ships in port at any one time might just be sufficient to provide most of Australia’s background energy load including some locations without national grid connection. The advantage of ship board reactors is that should something go wrong the ships can be moved a safe distance from population centers. The global fleet of large ships is around 45,000 ships with the largest number being bulk material carriers. So again I say that if the nuclear industry wanted to demonstrate competence, safety, volume manufacturing ability, and cost competitiveness, then that is the market to tackle first. I came across this article while looking for information on ship board Nuclear Reactors.